In a new book from National Geographic, celebrated astronaut and best-selling author Buzz Aldrin reflects on a lifetime of adventures and achievements and what he has learned through it all. 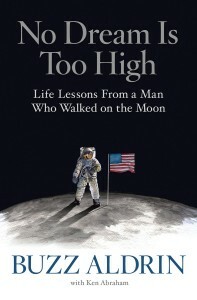 In NO DREAM IS TOO HIGH: Life Lessons from a Man Who Walked on the Moon (National Geographic Books; ISBN 978-1-4262-1649-7; on sale April 5, 2016; hardcover), Aldrin shares little-known stories with New York Times best-selling author Ken Abraham and highlights 13 principles that have shaped and guided his eventful life. Aldrin’s principles range from “laugh…a lot” to “write your own epitaph” and, while he speaks intimately and from the heart, his disarming candor permeates each lesson. “Once you’ve been first, it cannot be done again — not by you, not by anyone else,” he writes — and muses in his irreverent way about how it has felt to be known as the second man on the moon. Buzz Aldrin, best known for his Apollo 11 moonwalk, holds a doctoral degree in astronautics and, at age 86, continues to wield influence as an international advocate of space science and planetary exploration. He has written three nonfiction books, two science fact/fiction novels and two children’s books.